Los Angeles (March 22, 2017) – Disney’s live-action “Beauty and the Beast” continues to be a force at the box office. “Beauty” leads Fandango’s weekend ticket sales, scoring 94 out of 100 points on Fandango’s movie buzz indicator, Fanticipation, while the big-screen incarnation of “Power Rangers” (outpacing “The Maze Runner” at the same point in the Fandango sales cycle) follows with 84 points. Although the month is hardly over, Fandango’s March 2017 ticket sales have already eclipsed total ticket sales from the previous best-selling March (in 2016). 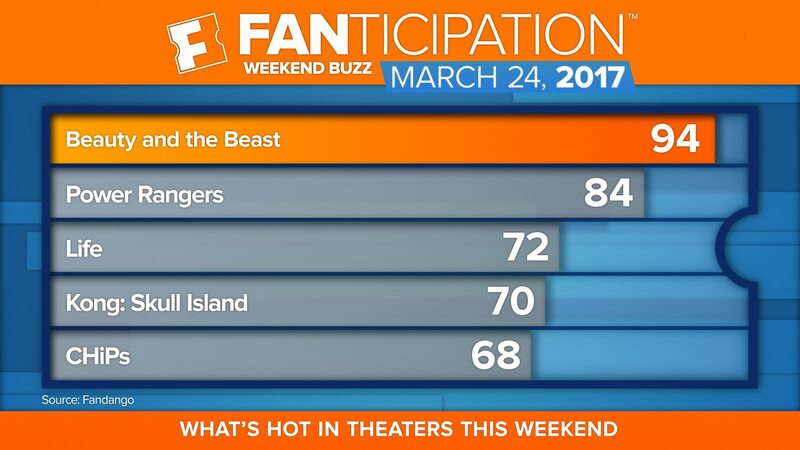 Tags: Fandango, Fanticipation, "Beauty and the Beast", "Power Rangers"